PowerPoint and Excel. Two popular Microsoft products used extensively in business. But which one is more powerful for creating business reports? Excel’s main reason to be is to collect numbers and data and perform calculations. Yes, it does offer charts and graphs, but no real way to sort multiple charts and show them easily to a group. PowerPoint, on the other hand, is made for presenting. PowerPoint’s slideshow approach lets you easily move from one slide to another with a simple mouse click and move forward and back through your presentation. With Excel, you have to flip back and forth through worksheets, which is very awkward. Using the Slide Sorter view in PowerPoint, creating and ordering your presentation is as simple as dragging slides around to change the order. PowerPoint makes it easy to insert or drag pictures or even videos onto your slide. You can add pictures of your products, people or stock photo metaphors along with illustrations and charts. 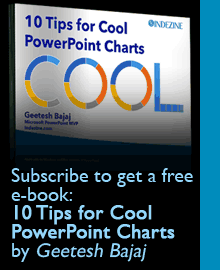 With PowerPoint, you can create a master Theme and have colors, graphics, font, font size, etc. repeated throughout the presentation. If you want to change any of these, the entire presentation is updated. The Theme can be used for multiple presentations. While there are some possible Tachometer charts for Excel, there are many more Tachometer templates for PowerPoint. Here is an example of a PowerPoint Tachometer template. PowerPoint also has the capability of showing your data as Infographics. Infographics are charts and diagrams used to represent information or data. They tend to provide higher impact. Here is an example of how an Infographic works. Using PowerPoint add-ins like DataPoint, you can link your presentation to data sources like Excel, RSS feeds, and databases. Now your data will automatically update with the latest figures daily or even hourly. Your latest sales, profitability and any other data is already updated in your presentation when you are ready to begin. Instead of showing a spreadsheet with numbers and formulae, you can use a data-enabled PowerPoint presentation to skip past the raw data and show it in a more visually pleasant format. Uploading it to SlideShare so you can share it over the Internet with your team or even the entire world if you prefer. With a data-driven PowerPoint, you get the best of both worlds. All the power, the raw data and the calculating power of Excel with the enhanced presenting and multimedia capabilities of PowerPoint. For your next business report, we recommend PowerPoint over Excel. Kurt Dupont, based out of Belgium heads PresentationPoint, a company that creates several amazing PowerPoint add-ins. After his Computer Science studies, Kurt started with Andersen Consulting (Accenture nowadays) in Brussels. After three years he moved to the Brussels Airport Terminal Company that runs the Brussels airport – this last placement inspired the start-up of Take-off (now known as PresentationPoint) in 1998.